Creatures Online (first dubbed Creatures 2011, later known as Creatures 4) was an official creatures game being developed by Fishing Cactus, licensed by Gameware Development. It was to be the first major Creatures game since Docking Station in 2001, and would set on planet Sphericus. The game was put on hold in late 2015, and has probably been shelved, but a successor, entitled Creatures Family, is currently in development by Spil Games. The game was officially announced on 16th May 2011 and was to be the first Creatures game for iOS and Android. BluesNews were able to confirm that the free-to-play game would be microtransaction-based (small fees), though "most of the content will be entirely free. 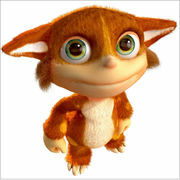 Bigben, the publishers, were given the rights to distribute Creatures Online, and all of the previous Creatures games in Europe. Fishing Cactus (Belgium based developer), Bigben (Publisher) and Gameware Development (the IP rights owner) are set to deliver a new Creatures game that maintains the characteristics of the earlier games. It will be free-to-play and available on PC/Mac and iOS platforms - iPod, iPhone and iPad. A collector gift box full of surprises will also be created. In approximately 2009, Fishing Cactus floated the idea of C4 amongst themselves and approached Gameware. Fishing Cactus then contacted BigBen Interactive about the game, and they provided funding. Grendels and Ettins would not be in the initial release of the game, as confirmed by Fishing Cactus, however they were on the "we might make them in an upgrade list". The game was to have been rendered in 3D, unlike other entries in the Creatures series. When the creatures evolution engine was updated to accommodate this, Fishing Cactus developed a crowd management system. In May 2013, Bigben partnered with ProSiebenSat.1 Games, who were to distribute, maintain and market the game in Europe. Fishing Cactus also changed the name of the game from Creatures 4 to Creatures Online. In 2016, Spil Games announced that they had bought the Creatures intellectual property from BigBen and were developing a free-to-play mobile game called Creatures Family to be released in 2017. Creatures Online was originally announced as coming with just four Norn breeds. However, on March 2013, Fishing Cactus announced that there would be 12 - 16 breeds included with the game. At Gamescom 2011, Fishing Cactus unveiled the first demo of Creatures Online. At the start, the player could choose either to create a male or a female Norn. Only two or three Norns could be created at the beginning. Once the player had selected the gender, they could then use sliders to customise their Norn's look and the fur colour. Once they finished, an egg appeared in the Treehouse. Like the previous games, the player could punish and reward their Norns by either tickling or slapping them. At Gamescom 2012, Fishing Cactus exhibited a second demo of Creatures Online. This demo took place in the Hatchery rather than the Treehouse, and several new features, such as Norn speech and the Science Kit, were added. The demo also delivered a glimpse into some work-in-progress interfaces, such as the hatchery, the splicing machine and the Norn collections. Angry Nornito also made his first in-game appearance. The Creatures Online Live Session demo showed many aspects of the gameplay, including the introduction of the Owner's Kit and Supply Kit. A third and final demo of Creatures Online was exhibited at Gamescom 2013, where they introduced the Kabuto Norns, along with many other new breeds, along with an update to the baby Norns that reduced their head size to a more realistic standard. At one point, Fishing Cactus considered implementing a skill system, to get the Norns to take care of plants, play with critters, repair toys and machinery etc. Skill at these tasks was intended to improve the norns' abilities and was meant to be inheritable by children. The stats were coded into genes, storing the value of each stat so that they could be inherited. Due to "side-effects" and the system not being "satisfactory", as of June 2012 its inclusion was being reassessed. On the 2nd of March 2012 Fishing Cactus confirmed that a Shee would be making an appearance in-game. The Shee featured is known as "Master Shee" and would act as a help assistant in the game and provide the player with information. 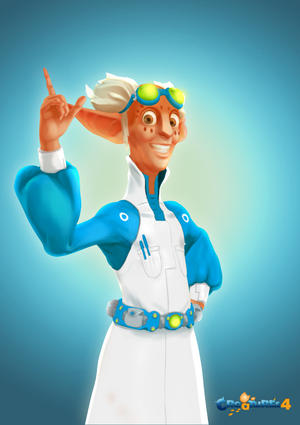 He would be the first ever Shee to make an actual live appearance in-game, and his design said to been inspired by Emmett "Doc" Brown from the Back to the Future trilogy. 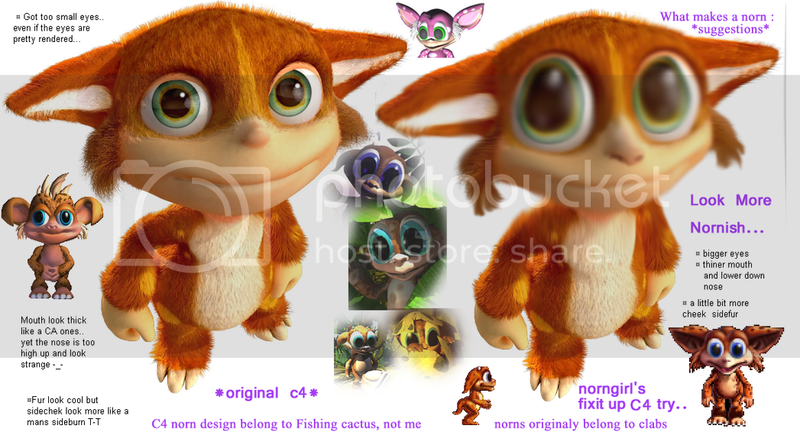 Along with a screenshot of the actual game, one of the first concept art images Fishing Cactus released on one of their blog posts was a pre-rendered image of a new Norn design that was to feature in the game, with the most prominent feature being that the Norns would have realistic fur, smaller eyes and a less cartoony appearance. Despite achieving mostly positive feedback from the Creatures Community, some members criticised the new design due to it being less cartoony and somewhat less cutesy than the previous Norns in the other games. As a result, the community member Norngirl made an edited version that more closely resembles the Norns in the previous games, which Don also mocked up here. Norngirl also made two other pics  and  as a helpful reminder of what past norns look like. 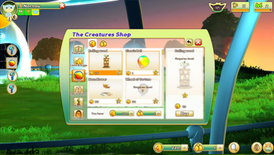 unlocking items in the shop (named "The Shee Market" in the Creatures Online Live Session) and in the machines. There was planned to be a boxed version available to buy, containing "all the old chapters in the series (1, 2, 3, DS at least)" along with a Norn figurine, a Norn with a unique genetic code for their game and the equivalent of twenty euros in the game's virtual wallet. There would be two currencies in game: coins, which will be collectable in-game by doing actions, and golden eggs, which would be occasionally given out as special occasions, could be traded for coins or could be bought in the shop for real money. The idea of payment in a Creatures game has garnered a lot of criticism since its announcement. However, Fishing Cactus reassured players that it would be possible to play the game without spending a single cent. The Crafting Machine was later introduced as a way for players to earn items without paying. The Coin Foundry was also a way to earn coins. 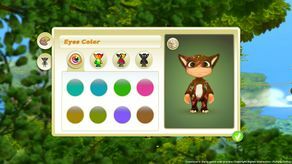 In the Gamescom 2011 demo, it was first shown that one of the many features included in Creatures Online is the Gene Splicing Machine, which allowed players to create their own Norn genomes rather than choose from a list of breeds. The player could also randomize what they wanted their Norn to look like. As shown in the demo, whenever the player's Norns reproduce the player could choose what features are inherited from the parents using sliders to control each future, if wanted the Norn to more closely resemble one parent than the other. There are limits imposed from the norn's genetic code on how customisable their appearance is, as they inherit their potential appearance from their parents. As of June 2012, this was the main mechanism by which the players would be able to edit the genome of their norns - focusing on the appearance of the norn. There were no specific plans for a Genetics Kit. Creatures Online was originally planned to be released in January 2012 on iOS (iPhone/iPad/iPodTouch), Android, PC (online client) and Mac (AppStore, online client), but the game was delayed to add more content, giving an estimated release date of Q2 2012. 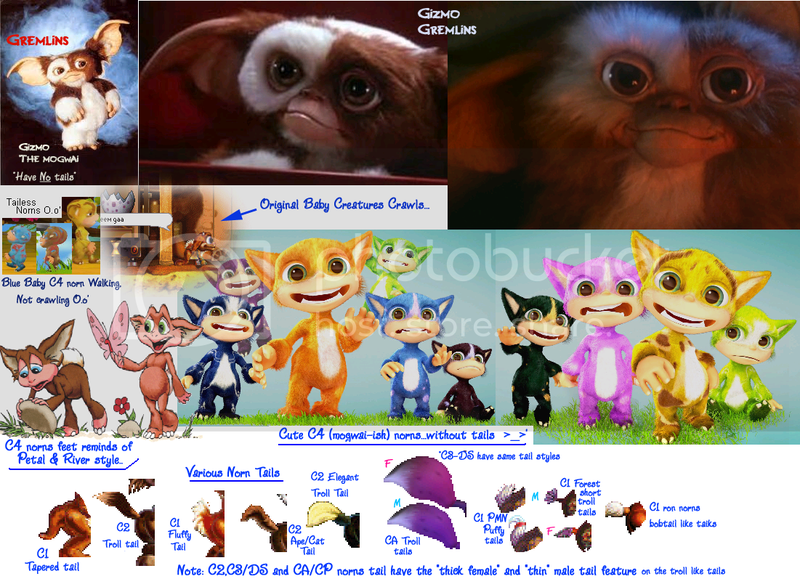 In June 2012, Creatures Online was delayed again, this time to Q4 2012. In November 2012, Fishing Cactus confirmed yet another delay, stating that they hoped to enter a beta phase around January or February, and that if this happened, a 'live date' of March to April 2013 was possible. The PGW page about Creatures Online had a release date of 26 April 2013, which was described by Lord Shee as being "not definitive". The game entered an in-house alpha stage on the 4th of March, and lasted about 8 weeks. In May 2013, Fishing Cactus revealed that they and BigBen had partnered with ProSiebenSat.1 Games, who will distribute, maintain and market the game in Europe. Fishing Cactus also revealed that they were changing the name of the game from Creatures 4 to Creatures Online. ProSiebenSat.1 Games booked the server network for Creatures Online, and planned to be ready with the server by roughly July 2013. A closed beta was planned to run at this time, but did not eventuate. From the middle of 2015, Fishing Cactus stopped all communication via their Facebook page regarding Creatures Online, resulting in negative backlash from many players. In July 2015, Fishing Cactus posted a Facebook comment saying that they are no longer in charge of community management and outreach for Creatures Online, suggesting fans contact BigBen Interactive instead. It is believed the game has run into publishing issues, but BigBen Interactive have assured everyone that the game has not been cancelled.https://www.facebook.com/fishingcactus/posts/10153031665194220 In November 2015, the French mobile gaming news website Pockett Videogames ran a story saying that Creatures Online had been put on "stand by" due to financial issues. Fishing Cactus posted an official statement on their blog in January 2016 confirming that Creatures Online had been put on hold, and that it was now up to BigBen Interactive as to what would happen with Creatures Online. 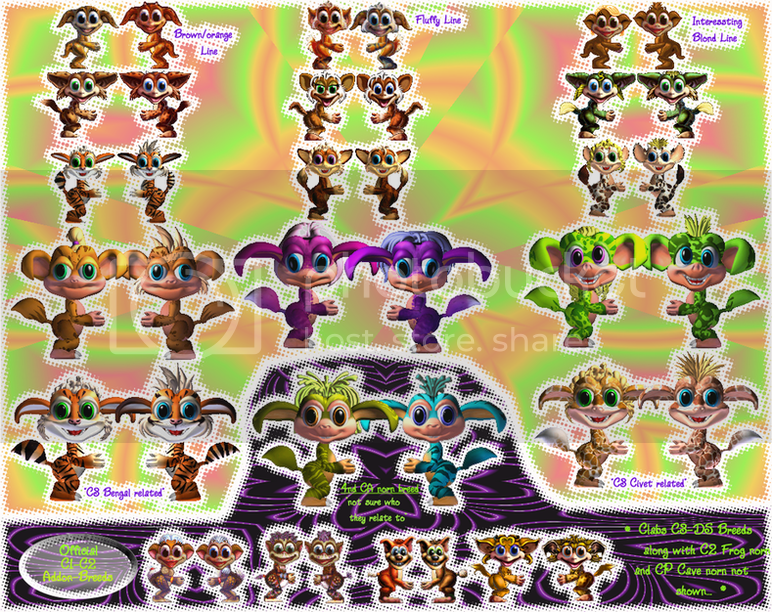 In March 2016, Spil Games announced that they had acquired the Creatures IP from Bigben and are currently in the process of developing a free-to-play creatures game called Creatures Family. It is currently unknown if the game will either be an entirely new game, or simply a renaming of Creatures Online, but Creatures Online appears to have been shelved either way, and it is unknown what will become of the current game if Spil Games wish to develop an entirely new game from the ground up. It was announced that third-party development would not be supported at the time of Creatures Online's release, but Fishing Cactus were looking at Valve's method of allowing third-party addons for Team Fortress 2 in developing a third-party content system for Creatures Online. This page was last modified on 8 September 2018, at 17:58.